This morning I finished a project that had I had been working on since January. Well I finished the embroidery part of the project, not all of the 'what-stitch-goes-where-in-what -colour-writing-down' bit. 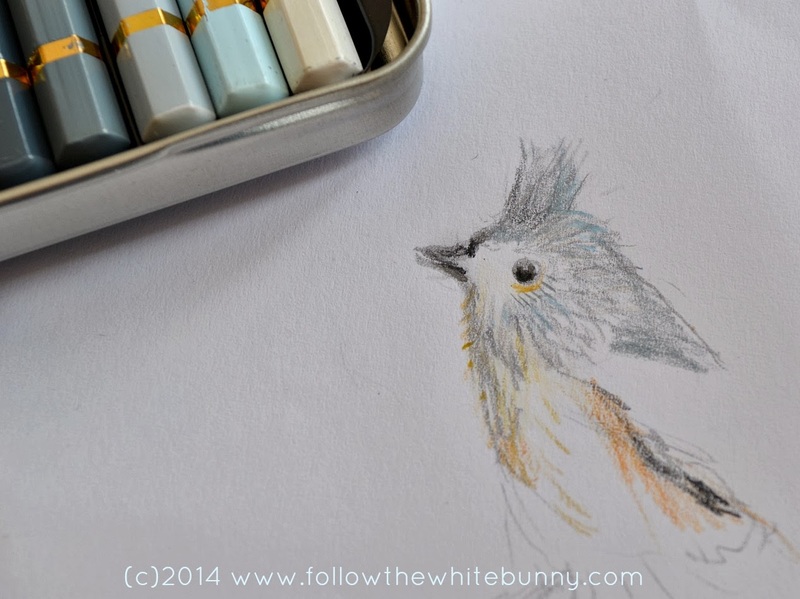 So with that nearly done I feel it's legitimate to start thinking about my next Tiny Animal Portrait. Quite a while ago I decided it would be a bird and I got some fabulous suggestions here on the blog as to what bird exactly it should be. I'm pretty sure I will start with this bird, the Tufted Titmouse. I made a quick sketch just now and I think he'll look fabulous in stitches! Nicole, you are such an amazing drawer. Incredibly so. I love your sketches and the amazing detail you have in their. Very talented, lovely sketch and it will make a superb embroidery. I cannot wait to see this little guy stitched up, the sketch is looking lovely! I'm excited to see your stitching of the feathers! I love that your sketching lines look like little stitches themselves. I'm excited to see what this turns into!